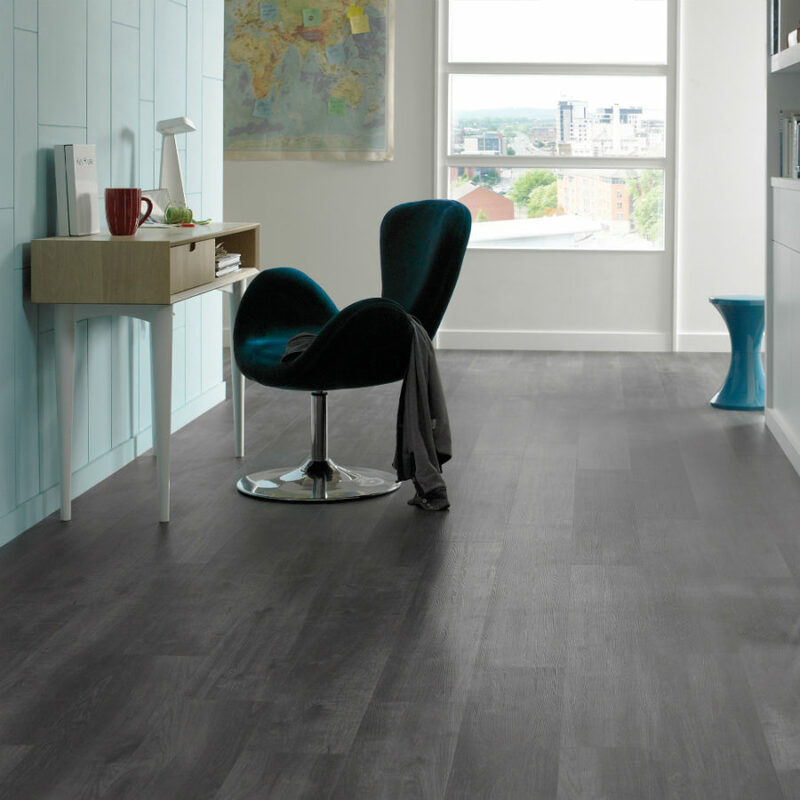 Wood look tile was destined to become popular. It’s practical, more affordable, and offers a wide range of choice between textures, colors, and tones. Low maintenance allows to use it anywhere from kitchen to bathroom, places where wood doesn’t last long. Effect and color options are quite literally limitless and can offer a sophisticated parquet finish as well as a reclaimed wood texture look. All you’re left to do is decide what you’re after. 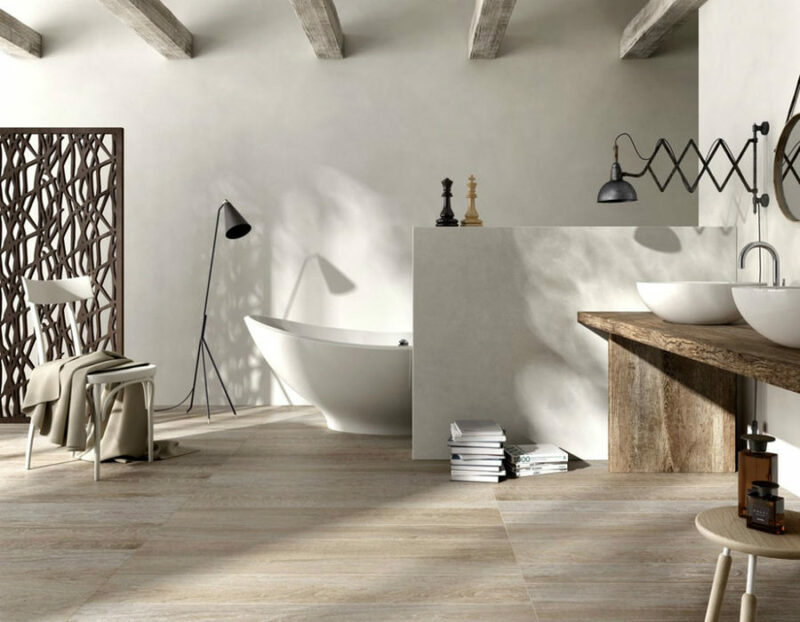 Even though most wood look tile is made of porcelain and ceramics it looks so natural and convincing at times, it can be difficult to tell whether it’s real or not. If you’re trying to create a warm, inviting, traditional living room interior this is the effect you want. As close to the real thing as you can get. Dark, light, brown, and red, wood look tiles come in all kinds of hues and shades. Darker and lighter tones work best in contemporary interiors, however. 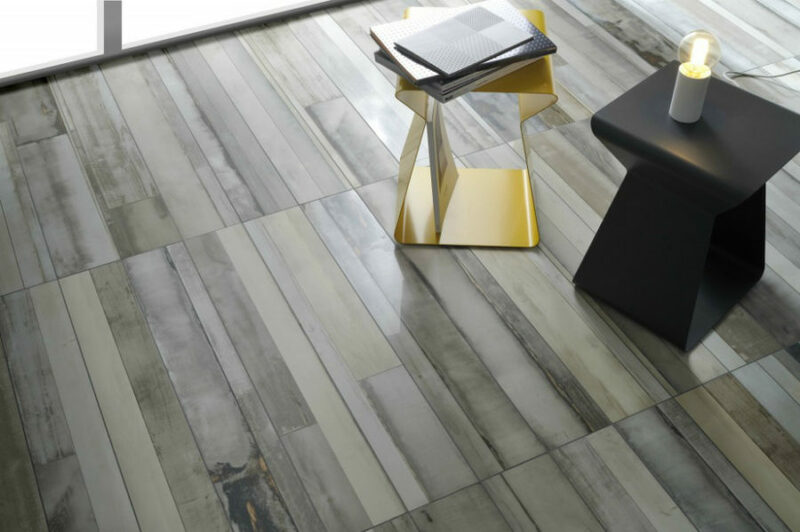 Adding smart and stylish aesthetic to any room these floor tiles are made to contrast the neutral color schemes of contemporary rooms. 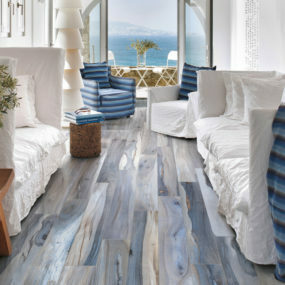 A bit more texture in wood look tile design and your contemporary room gets more dimension and detail. Lines, grain, and tone gradation is what makes wooden floors so interesting. Intriguing but subtle wood texture, regardless how natural, can bring a lot to the interior. Take a look at this contemporary living room. It would look much more predictable even with solid wood floors without much texture or discoloration. 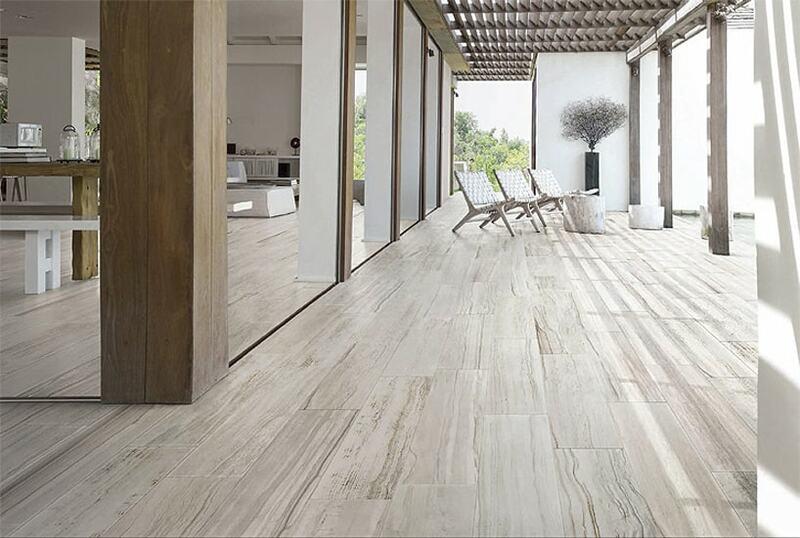 With these stone tiles designed to mimic wood texture it suddenly looks unusual and unexpected. 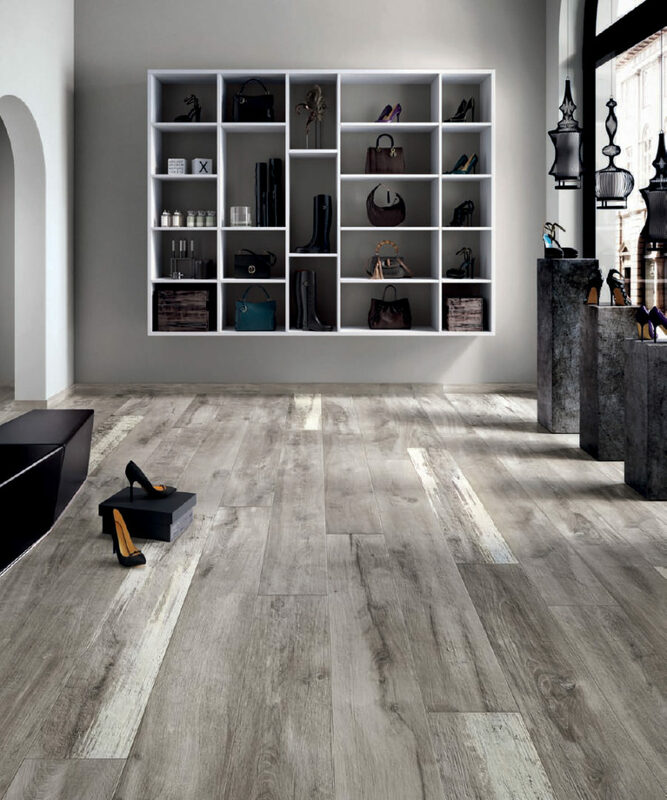 Surprisingly, wood look tile can be made of stone that at times bears a vague resemblance to grey wood. Of course, choosing it means giving up the warmth only wood can bring both aesthetically and tangibly. 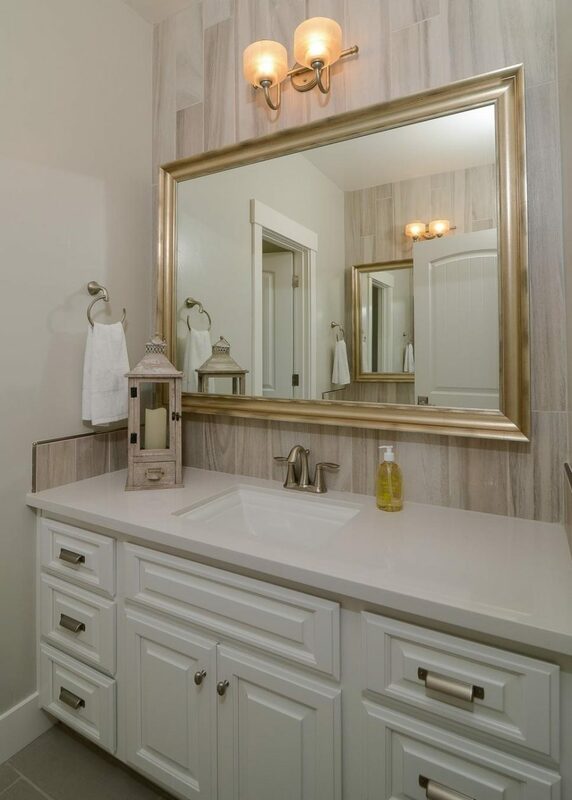 Granite is sometimes used in bathroom design to create that wood texture look, but for all its luxury and beauty it increases the finishing cost of remodeling. 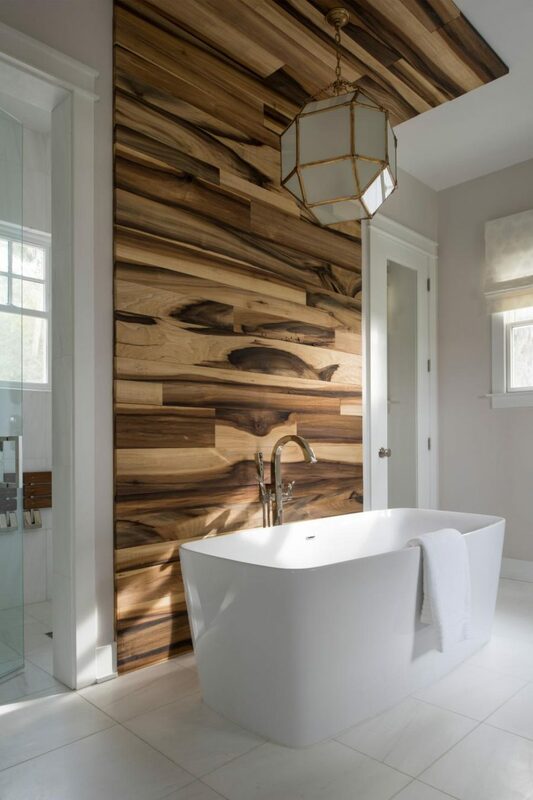 What can be more luxurious than a bath finished with wood? 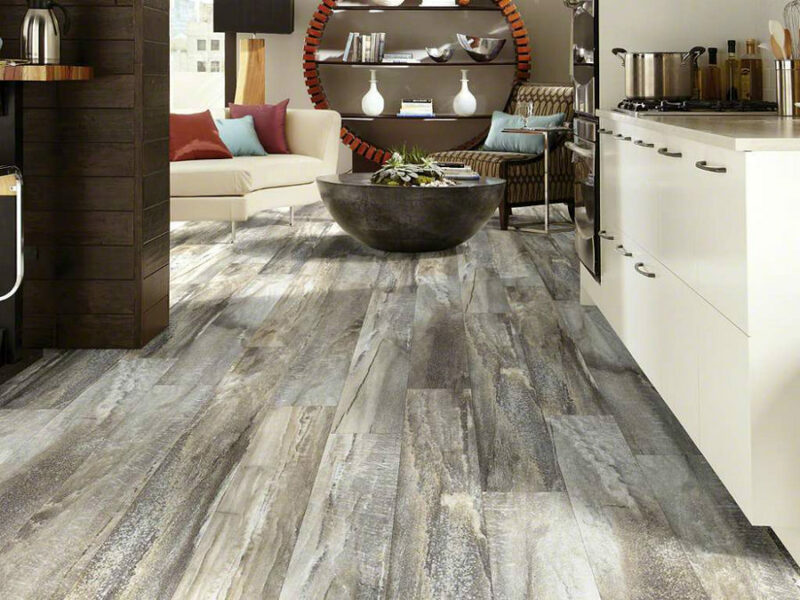 Wall paneling and floor tiles are widely available for anyone who wants to mimic the look without splurging. Besides it’s not very practical to have real wood anywhere near humid, water-exposed areas. Wood look tile is also helpful for creating accents and feature walls. This neutral bath got instantly more exciting with a textured backsplash extending to the ceiling to accentuate a pendant light. There is some inexplicable and yet undeniable charm about a wooden bath regardless of finish. 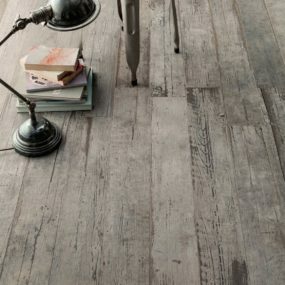 Polished wood look appears just a bit more luxurious than the rustic vibe of reclaimed wood. Walls, floors, even ceilings can be covered with wood look tile and every combination in between will always seem beautiful. 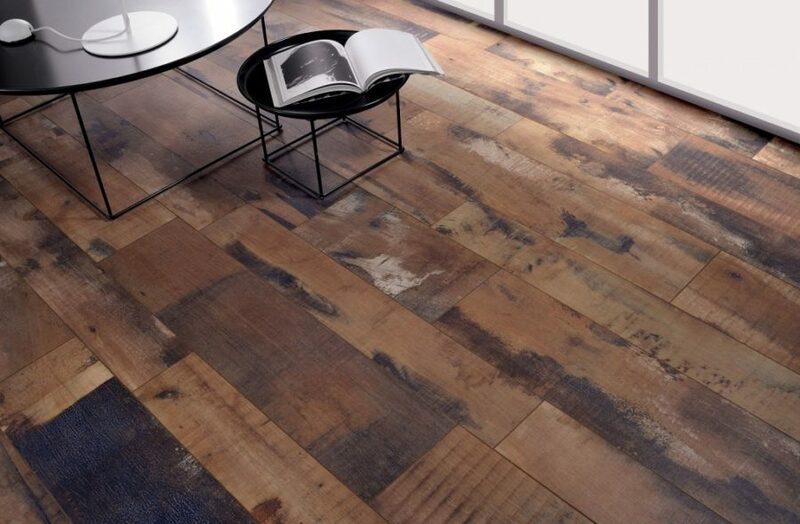 When we say there are a lot of wood finishes available on the wood look tile market we mean even old wood. Stained and discolored old reclaimed wood look is a perfect fit for industrial lofts and conversions as it allows to preserve the rough aesthetic of the place. Painting wooden floors isn’t an easy task. 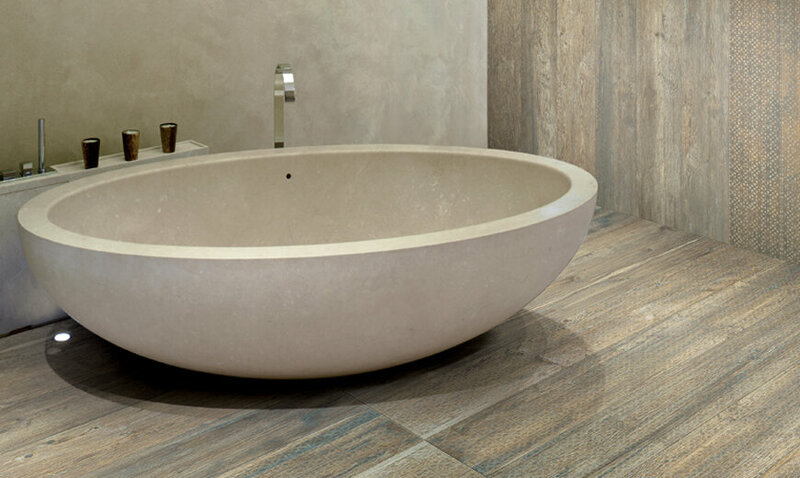 In fact, nothing that concerns refinishing wood is easy, so why not go for the light wood look tile instead? Fresh, breezy, and incredibly luxurious it can extend outdoors marrying indoor and outdoor spaces in a beautiful way. Light wood finishes have that luxury feel to them regardless of how and where they’re used. 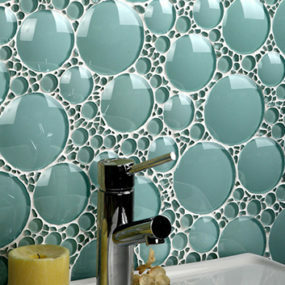 Take this Kerrie Kelly bath design, for example. She took the light wood look tiles to this accent wall/backsplash and turned a plain neutral bathroom into a fancy-looking ensuite. 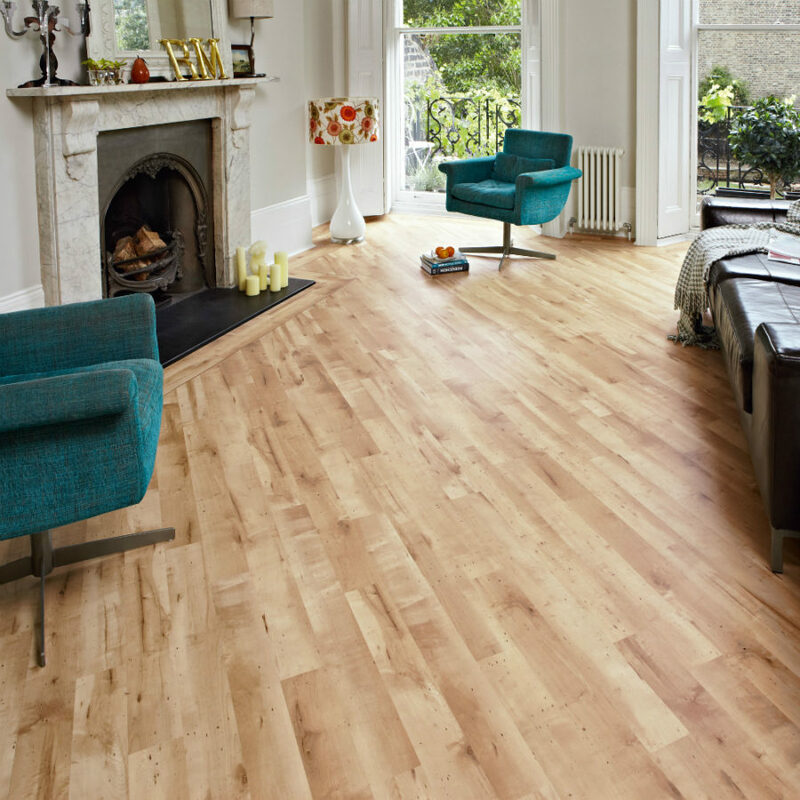 Light wood floors look good in any room. In the bathroom they somehow look especially luxurious. Even the old wooden beams and a reclaimed wood table vanity cannot take away from this bath’s luxury created by light wood look tile and a freestanding tub. 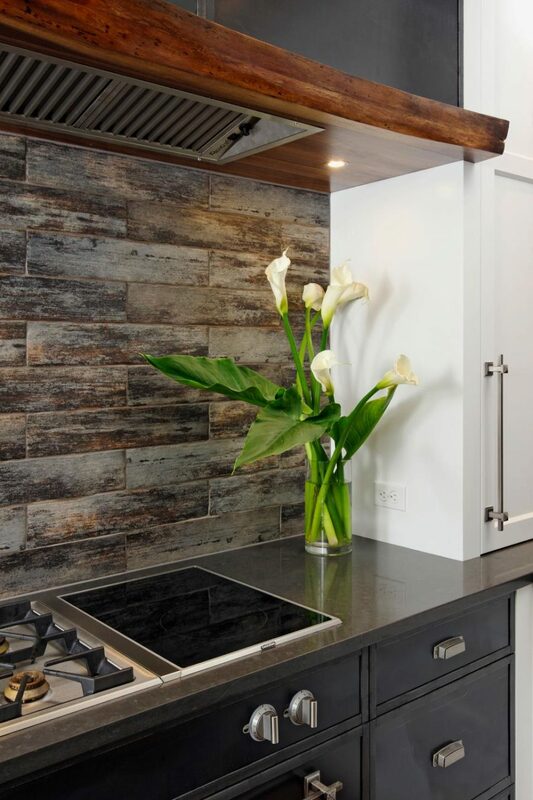 The backsplash is the last place you’d want to use real wood. 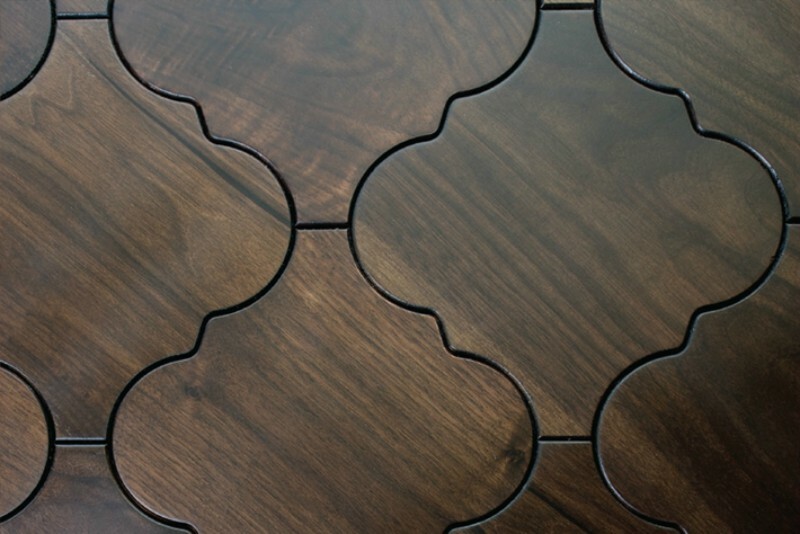 But how cool does wood like tile make it look, especially with all the available finishes? 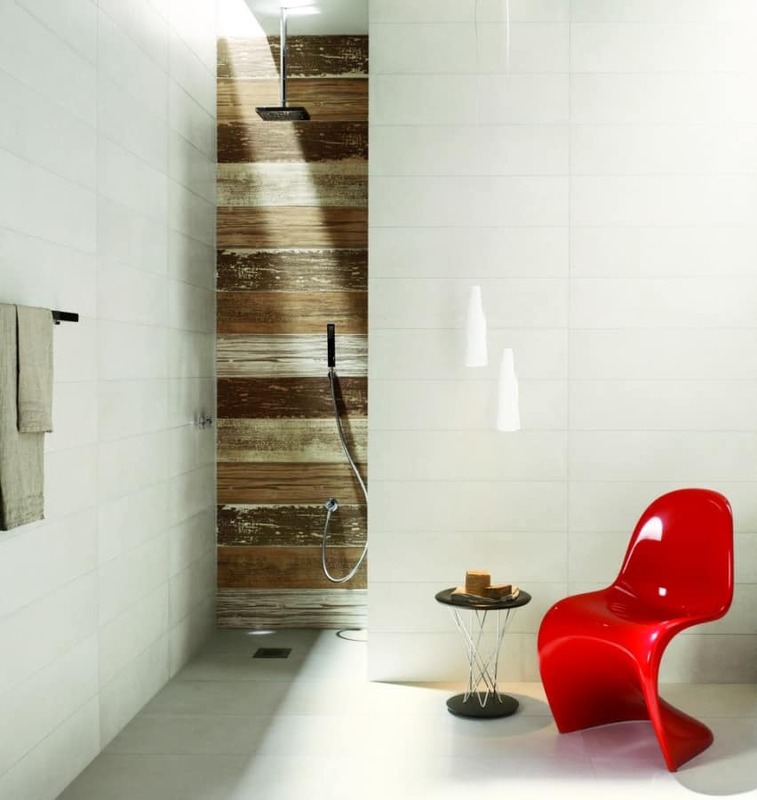 Shower feature wall is a perfect spot to try out your wood look tile. The result is unexpected and fresh. Ceramic tile works best in a kitchen, but with every other design it becomes simply predictable. Surely wood look tile wouldn’t work with every style (or would it? ), but if you want something different you have to give it a chance. 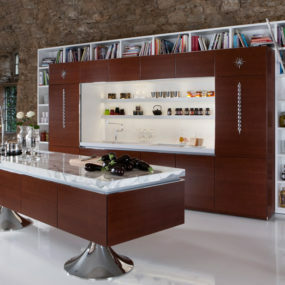 Since wood works with many other different materials it allows a world of design possibility. You should only try and imagine it. 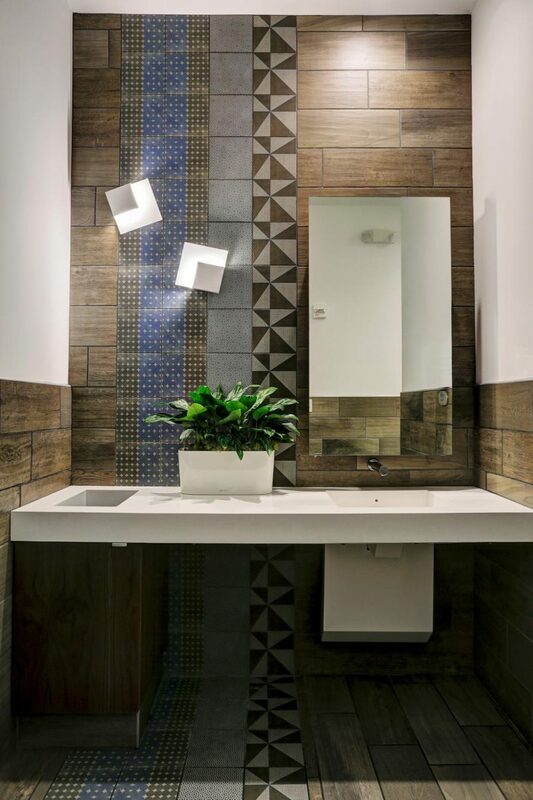 Gin Braverman decided to mix and match this wood tile bathroom backsplash to make it more interesting and it proved to be a brilliant idea. Kitchen floors probably get the worst of it when it comes to spills, traffic, and dirt. So it’s understandable if you don’t want to invest in hardwood or stone floors to have them simply ruined. 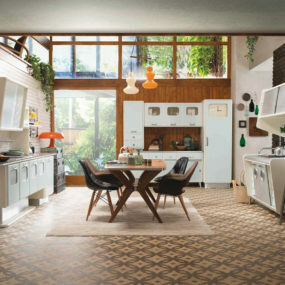 Again porcelain or ceramic tiles made to imitate wood can come in handy during your next kitchen remodeling. 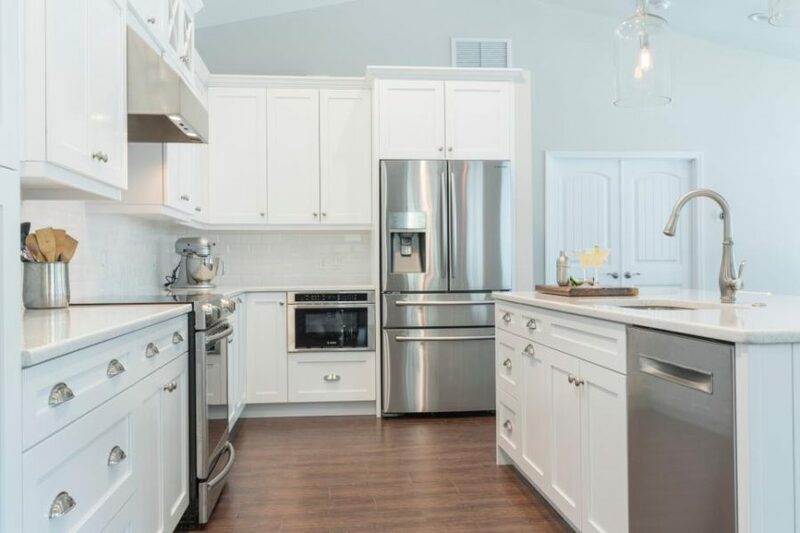 Opt for realistic wood look tiles to complement your white kitchen interior or contrast your dark cabinets with tiles that look like light wood. 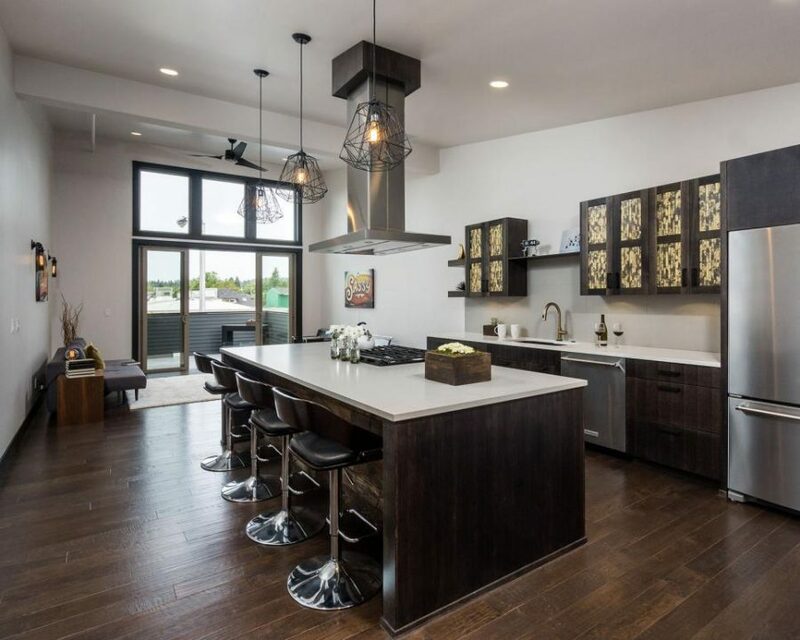 Jordan Iverson opted to complement the dark kitchen cabinets in this stylish modern kitchen design of his. 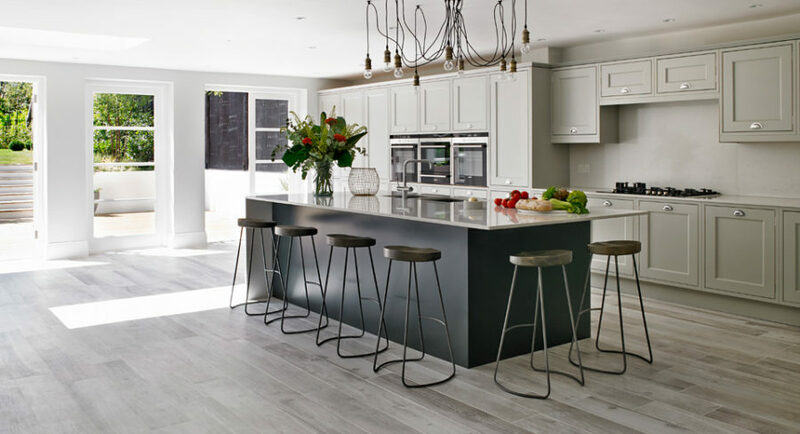 In this kitchen by Leivars the cabinets contrast with the dark kitchen island but look in tune with the ash wood look tile floors. 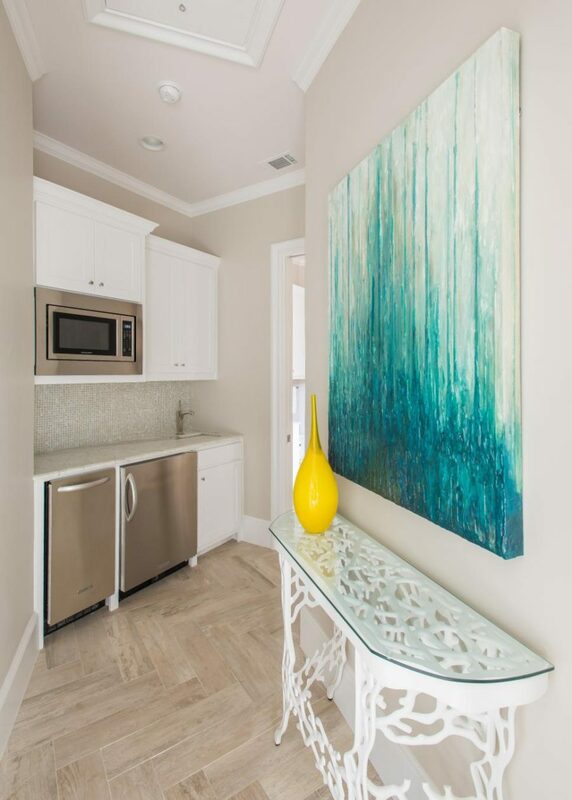 Although light colors show stains and impurities better than darker ones, the smooth easy-to-wash surface of porcelain and ceramic tiles makes it a real non-issue. Wood pairs well with any other material; it only looks better. 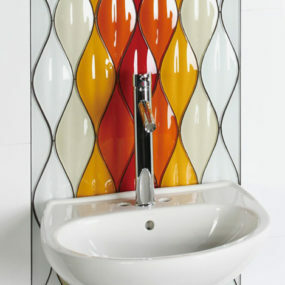 Here, it’s stainless steel and glass as well as mosaic ceramic tiles. Also, in a small room like this one light wood is the best flooring choice as it makes the narrow space more airy. Besides looking realistic and being available in a wide assortment of designs wood look tiles may also be arranged in various patterns. 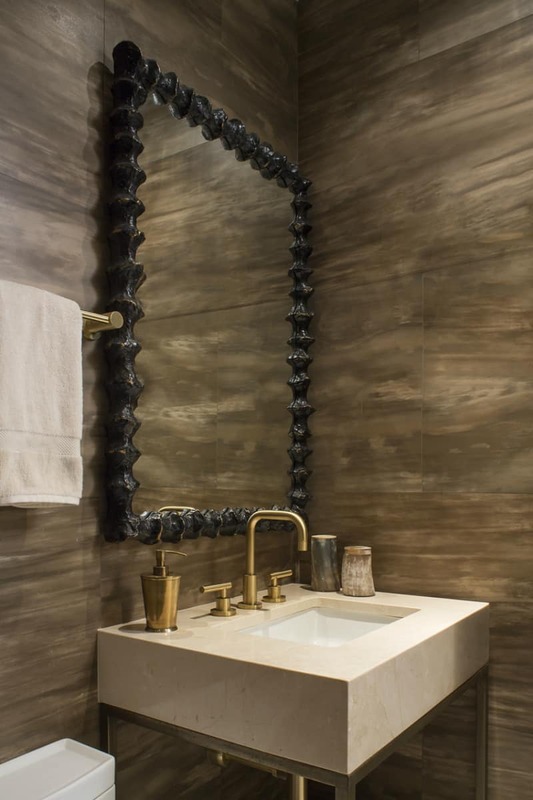 Lay them in straight rows or arrange them in a stylish trendy herringbone pattern, arrange tiles of various texture and colors together; options are limitless. 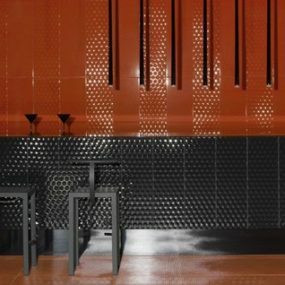 Wendy Labrum makes a case for using stone tiles mimicking real wood. Blurring the line between stone and wood the walls look almost alien. The impression that is highly strengthened by the mirror’s organic frame. Brass hardware looks fitting for the stone’s color and does a great job bringing us back to Earth. Finally, if you’re looking for real deal wood tiles, there is a collection that is bound to make your heart skip a beat. 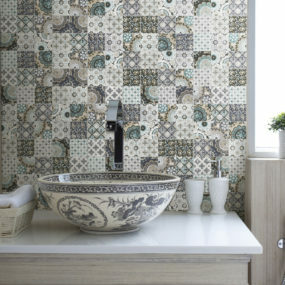 Designed by Jamie Beckwith the luxurious tiles come in lotus, jigsaw, hexagon and many other exciting shapes as well as numerous wood species and stains. 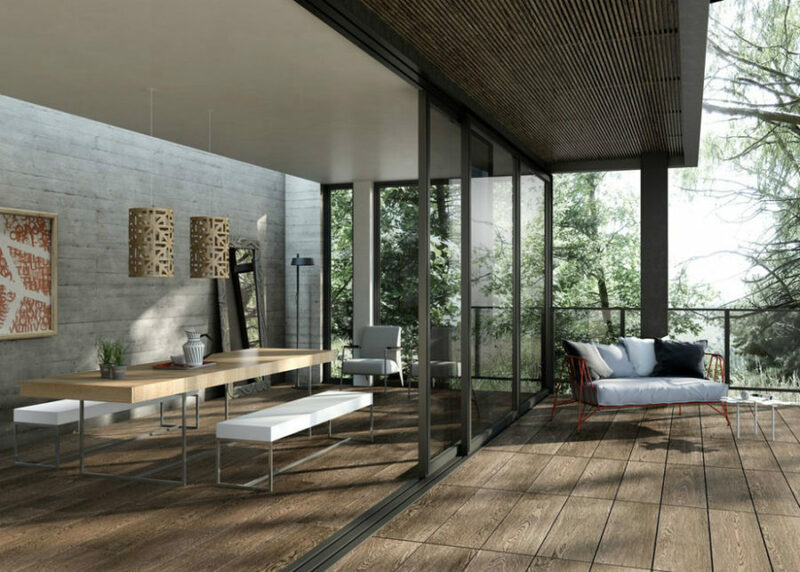 While wood look tiles have many advantages there probably isn’t a material that can rival wood’s natural warmth and intricate texture. Nevertheless, some of these designs look really convincing, don’t you think?